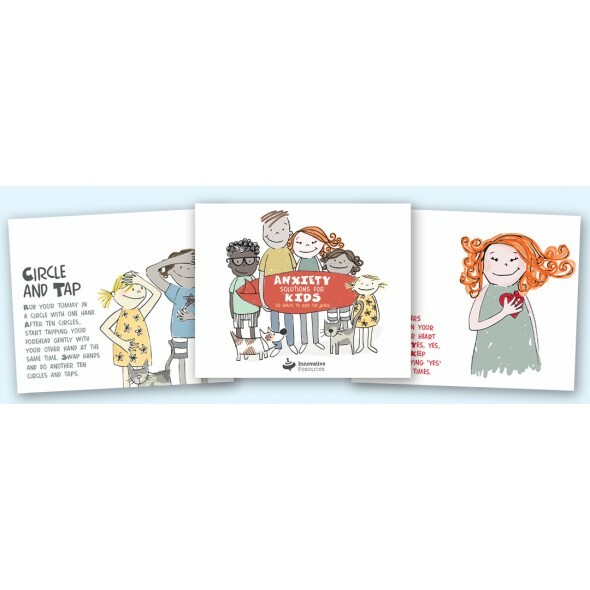 Called Anxiety Solutions for Children: 50 ways to ride the wave, these cards are based on solution-focused, strengths-based techniques used for many years by experienced clinical psychologist, Selina Byrne, to help children with worry and anxiety, and to build their well being and resilience. Most kids and people with anxiety think they have little or no control over how they feel or what thoughts they have, so author, Selina Byrne and publisher of strengths-based tools, Innovative Resources, got together to design a tool that will help children learn how to take things to a new place in the brain. You can do so many things with these cards. You can learn strategies systematically, one at a time, or you can dip in and choose by random. The idea is to just do the activity according to the brief instruction on the cards and then notice which strategies you enjoy the most, or which ones have the biggest brain impact. Selina Byrne has used the methods extensively with children in her private practice for more than the last 10 years, blogs about them and has written a book about them. Combined with the delightful illustrations of Katie Jardine, these cards are perfect for 3—14 year-olds.